The gathering location of the is easy to find. Well organized event, we went to floating market and local seafood market. The tour guide (Ahong) has good knowledge of the area and also offers good shopping and food tips. Explore one of Thailand's oldest and most unique traditions. The Damnoen Saduak Floating Market Tour takes you to the most popular floating market in Thailand. 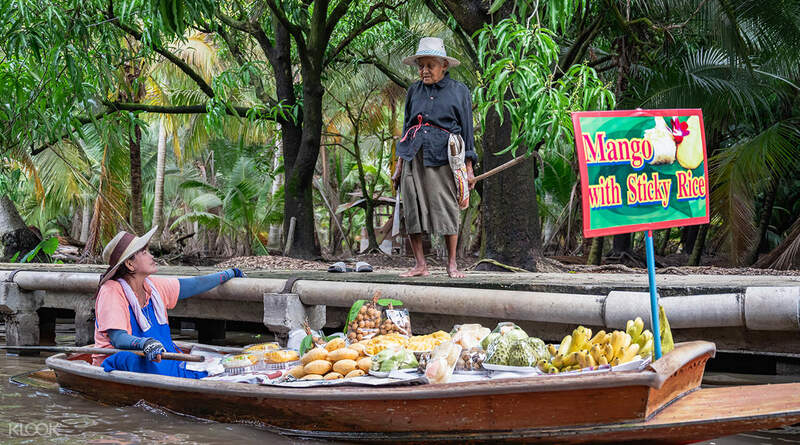 Hop onto a decorated long-tail boat and glide down the narrow canals hunting for exotic fruit and vegetable deals. 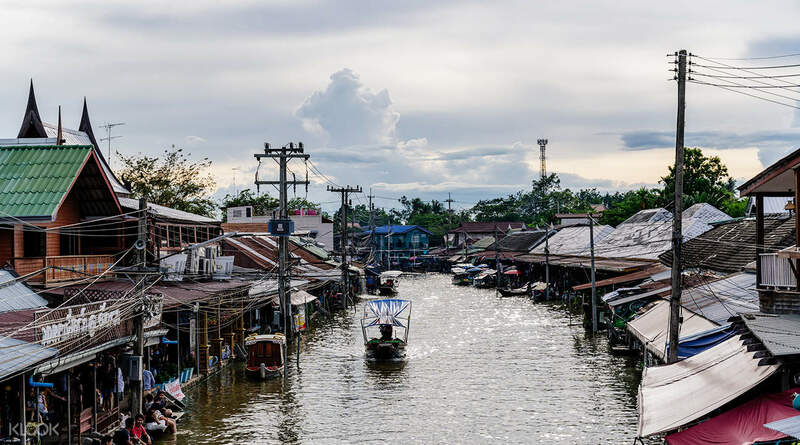 Peek at the small houses on stilts that line the shore and discover Thailand's traditional peaceful lifestyle contrasted to the hectic buzz of the river market. 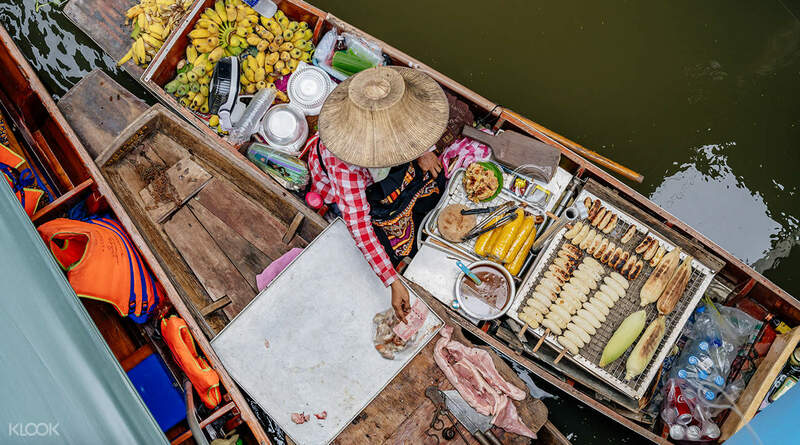 Pick up a few souvenirs and take stunning pictures of the winding waterways a one-of-a-kind Bangkok experience. Choose to extend your tour by shopping at King Power with exclusive privileges included in your package! 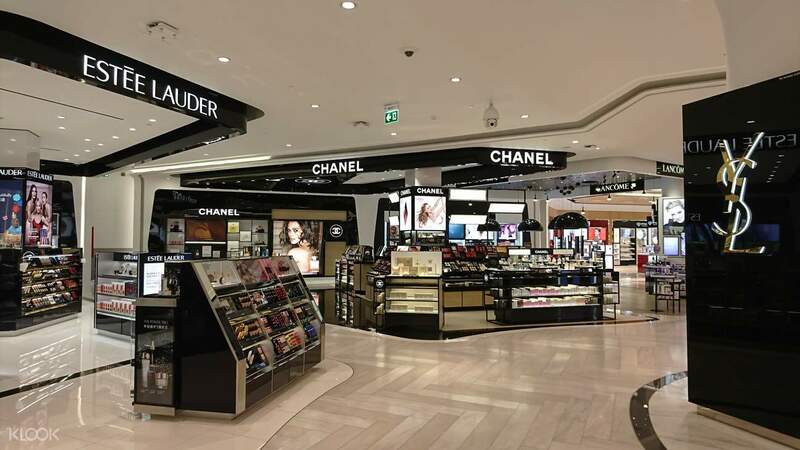 Treat yourself with duty free products from various international brands while enjoying free discounts. Have a memorable stay in Bangkok by visiting these major attractions. Get the VIP treatment when you shop with King Power Duty Free Privileges! This is a fun activity. Our guide took us to an open museum - which explained some history on the floating market. There were plenty of stuff available at reach - from food to clothing. I was joined in the tour with Koreans, so our guide Eak (not sure if I have it correct) was patient enough to translate to both Korean and English. He gave us sweets and snacks to try (super kind). Overall, experience was good. This is a fun activity. Our guide took us to an open museum - which explained some history on the floating market. There were plenty of stuff available at reach - from food to clothing. I was joined in the tour with Koreans, so our guide Eak (not sure if I have it correct) was patient enough to translate to both Korean and English. He gave us sweets and snacks to try (super kind). Overall, experience was good. I will definitely come back to thailand. And I will try floating market again. Our tour guide ( Suan ) is very accommodating. She make sure that all of us is okay. Our driver make sure that we safe going to the market and until we return at the drop off. Thumbs up! I will definitely come back to thailand. And I will try floating market again. Our tour guide ( Suan ) is very accommodating. She make sure that all of us is okay. Our driver make sure that we safe going to the market and until we return at the drop off. Thumbs up! Good, organised tour. You get a good value for your money. I would recommend this to people who've never been to any floating markets. Even though it's quite touristy, you end up having a good time and plenty of opportunities to take a great shot! Special thanks to our guide Ball ( great knowledge and organisation skills). Good, organised tour. You get a good value for your money. I would recommend this to people who've never been to any floating markets. Even though it's quite touristy, you end up having a good time and plenty of opportunities to take a great shot! Special thanks to our guide Ball ( great knowledge and organisation skills). It was a lovely experience and well organised by the klook team. Our tour guide, Bon, was really nice & helpful. Recommended for those who wants to get out from the busy bangkok. Local seafood market was also cheap and yummy! It was a lovely experience and well organised by the klook team. Our tour guide, Bon, was really nice & helpful. Recommended for those who wants to get out from the busy bangkok. Local seafood market was also cheap and yummy! Very good experience to be on one of the most famous floating market in Bangkok. The guide brought us to a local seafood market and it’s an amazing seafood meal we ever had. We get to choose our own seafood and the Chef cook to order. Will recommend everyone to go on this trip. Very good experience to be on one of the most famous floating market in Bangkok. The guide brought us to a local seafood market and it’s an amazing seafood meal we ever had. We get to choose our own seafood and the Chef cook to order. Will recommend everyone to go on this trip. 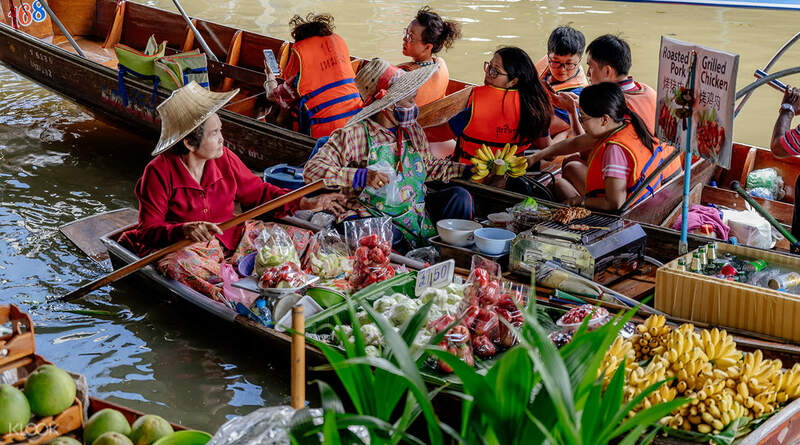 This half day tour gives an awesome opportunity to visit the floating market. But what’s more to enjoy is the one and a half hours boat ride. 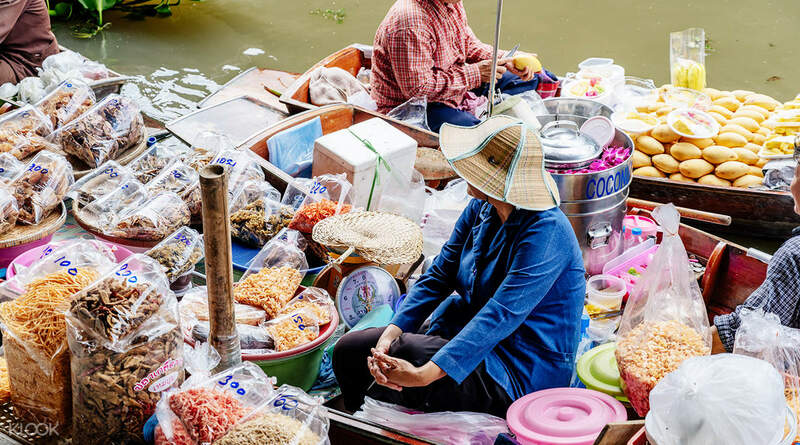 While in the boat, you can ask the boatman to pause or make a stop to your desired stores but prices tend to be higher than the other markets in Thailand, but if you’re good in haggling, you might just buy something at the right price. Our amazing tour guide, Ms. On, gave that as an insider tip, try asking for 20-50+% discount (even with the mango sticky rice). And you’ll also visit a seafood market where you can eat lunch but it’s not really for solo travelers, so it’s more recommended to eat at the floating market after the boat ride. Dried squid flakes and fish strips are cheaper at this market, so grab some if you go here. Overall, it’s truly an enjoyable experience. This half day tour gives an awesome opportunity to visit the floating market. But what’s more to enjoy is the one and a half hours boat ride. While in the boat, you can ask the boatman to pause or make a stop to your desired stores but prices tend to be higher than the other markets in Thailand, but if you’re good in haggling, you might just buy something at the right price. Our amazing tour guide, Ms. On, gave that as an insider tip, try asking for 20-50+% discount (even with the mango sticky rice). And you’ll also visit a seafood market where you can eat lunch but it’s not really for solo travelers, so it’s more recommended to eat at the floating market after the boat ride. Dried squid flakes and fish strips are cheaper at this market, so grab some if you go here. Overall, it’s truly an enjoyable experience. Tour guide was great. However, there was a hiccup in the morning due to the number of people there. It would be great if your guides hold up a banner so that we can know our tour guides/groups. Tour guide was great. However, there was a hiccup in the morning due to the number of people there. It would be great if your guides hold up a banner so that we can know our tour guides/groups.